This site is designed to offer links for deepening studies related to contemplation. It is intended to refresh and inspire much as those cherished meditational moments spent in a sunlit garden, breathing in the lovely perfume of delicate blossoms and listening to the melody of the fountain's crystal waters splashing into a carved stone basin. A rainbow meditation based on the colours of the chakras, illustrated with flowers. 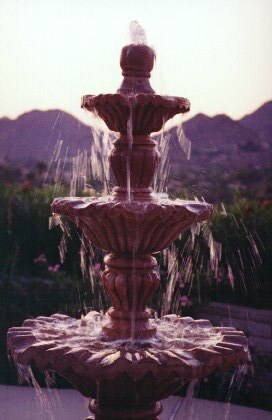 Fountain Gallery Fountains I have visited.